Goa has some amazing beaches, and draws a steady stream of local and international tourists. In the north, Anjuna Beach once played host to hordes of hippies, but is now home to a number of trendy beach bars as well as the famous Wednesday Market. The new hippie haven is Arambol beach, also good for dolphin-viewing and paragliding. With its white-sand beaches, Vagator is gaining in popularity. However, the sea is not safe for swimming due to the rip tides. The busiest, most commercial beach is Calangutell, while neighbouring Baga Beach has great nightlife spots. In the south, Agonda is a quiet stretch of beach with a few souvenir stalls and restaurants, while Benaulim Beach, south of Colva, is known for its fishing and laid-back atmosphere. In recent years, Benaulim has become popular with tourists wanting to get away from Goa's party reputation and just lay back, jog along the long stretch of beach and indulge in the city's fresh and healthy culinary fare. The shady palm trees and soft sands of Palolem Beach, also known as Paradise Beach, are backpacker territory. However, it's also a great place for a dolphin cruise or picturesque sundowner at one of the many beach bars lining the water. Nearby Patnem has some lovely beach huts available to rent. There are a couple of great beaches to take the kids to in Goa. 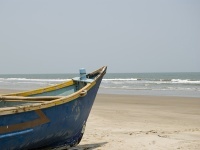 The fishing village of Benaulim, near Colva, has a few quiet spots with soft sand and beautiful clean water. A firm family favourite is the Mandrem beach area, which offers shallow waters for kids to play in, and beach beds for parents to relax on. Between the beach at Mandrem and the dunes, there's a little wooden bridge crossing a river that kids love to play on.